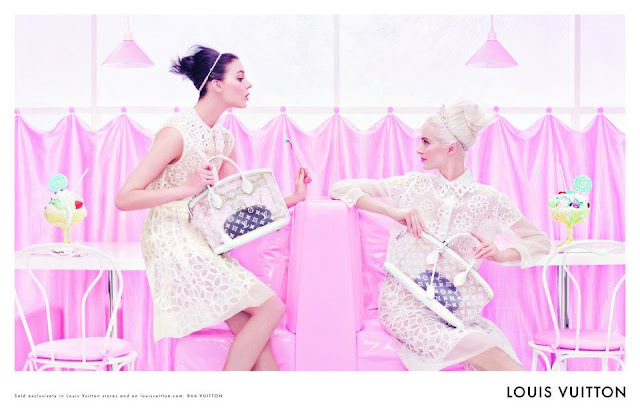 "The spirit our Spring/Summer 2012 collection is reflected beautifully in this new ad campaign," says Louis Vuitton Artistic Director Marc Jacobs. "All the tone and texture of the collection – the lightness, the prettiness, the broderie anglaise, the millefeuille layers of organza – are recreated in these wonderful images by Steven Meisel. It is all very soft and very sweet, yet at the same time very bold and very graphic." Up-and-coming models Daria Strokous and Kati Nescher are the lucky pair chosen to sample the parlor's assorted delights while wearing some of the season's standout looks, including romantic broderie anglaise dresses, ladylike shifts embellished with strass, studs and 3D flowers, and sorbetcolored suits with white lace collars. Marc Jacobs and Steven Meisel have created a stunning campaign that not only captures the romance and lightness of the runway show, but expresses it in an entirely fresh and playful way – and in a style that is unmistakably Louis Vuitton.